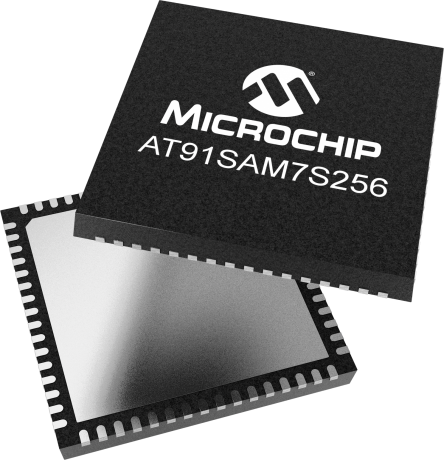 Microchip's ARM®-based SAM7S256 is a member of the SAM7S series of flash microcontrollers based on the 32-bit ARM7TDMI RISC processor. It operates at a maximum speed of 55MHz and features 128KB of flash memory and 64KB of SRAM. The peripheral set includes a Full Speed USB device and Phy at 12Mbps, UART, two USARTs, TWI (I2C), SPI, SSC, two PWM timers, three 16-bit timers, RTT, 8x10-bit ADC and 32 IO lines. It achieves single-cycle instruction access from embedded flash at 27 MIPS. The multi-layer bus matrix, multiple SRAM banks, PDC, and DMA support parallel tasks and maximize data throughput. The SAM7S256 operates from 1.65V to 3.6V and is available in 64-pin LQFP and QFN packages.